Opponents of President Mamadou Tandja of Niger have accused him of trying to turn the country into a dictatorship. Mr Tandja, 70, dissolved parliament hours after the constitutional court rejected his plan to hold a referendum on extending his time in office. He is due to complete the permitted maximum of a decade in power, two five-year terms, later this year. President Tandja's supporters say he deserves to stay on as he has boosted the uranium-rich country's economy. Observers in the mutiny-prone country told the BBC's Idy Baraou they fear the political limbo may give the army an opportunity to intervene. Meanwhile, the West African regional body, Ecowas, has warned that the situation is very tense. The group's director of political affairs, Abdel Fatau Musa, told the BBC French Service he believed things could get even worse and stressed the need for dialogue. Mr Tandja has the constitutional right to dissolve parliament, but the chairman of the opposition RDA party, Abdoulahy Diori Hamani, told the BBC the president's move had come as an unwelcome surprise. Human rights campaigner Abdoul Kamara Dine said it reminded him of the worst kind of African dictatorships from the 1970s. "Our man is corrupted by power. 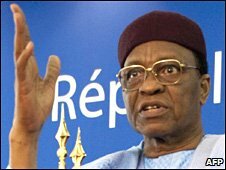 He wants to create a kind of kingdom, which can't be - Niger is a republic," he told the BBC's Network Africa programme. The dissolution of parliament marks the end of a six-month struggle between the president and parliament over the third term issue. Mansur Liman from the BBC's Hausa Service says the president is now likely to press ahead with his plans for the referendum. According to the constitution, he has three months before elections must be held for a new parliament. Analysts have raised questions about how he will fund the referendum and polls without the help of donors. On Tuesday, the constitutional court said Mr Tandja, who was first elected in 1999, was breaking his oath of office by trying to hang on. He had previously promised to quit in December this year, a month after presidential elections were due to be held. This decision is a path to dictatorship in the country. The national assembly is going to accuse the President of felony and impeach him. This is going to put the country into political turmoil after a decade of political stability. It's a shame and my advice to the President and all the opposition leaders is to put forward the national interest of the country. This is really a sad day for our democracy just for the sake of extending in term in office despite the widespread opposition and the ruling of the constitutional court against the president's ambition. I hope that the people of Niger will stand up against the president and reject his referendum. I also call upon the international community to press on Tanja Mamadou to respect the current constitution and step down by the end of his second term. else, he may give the army an opportunity to intervene. Niger is peaceful country, so please no trouble in our beloved Nation. The decision by President Tandja to dissolve parliament in order to change the constitution and hold onto power is not new to Africa. African leaders are noted for holding onto power, so it's not strange. Bravo President Tandja. Follow the footsteps of your African brothers. Ten years in power is very small for Africa especially when such a mineral has been found in Niger. This move by the president of Niger is nothing short of a coup d'etat. The African Union should not just stand by and watch this unfolding drama proceed to its logical end, for it is a recipe for chaos. I think it should intervene and call Mr Tanja to order. The AU should not only condemn coups carried out by the military, but should also condemn these "wolf in sheep clothings democrats" we have in Africa. Dissolving parliament in a desperate attempt to get an unconstitutional and controversial third term is a transparent mark of political immaturity from a man of 70 who is operating with the 1970s African leaders' mentality. Tandja should make a trip to Malawi and listen to Bakili Muluzi. I thought the example set by Ghana recently will encourage leaders in Africa to reason and realize that they are not divine rulers and that the country they lead is not their personal property. Tandja should do the honorable thing just as Rawlings and Kuffour in Ghana did and are now enjoying their private lives.